The United States may have avoided the brunt of Hurricane Matthew’s deadly rain and wind storms, but it wasn’t enough to prevent the Southeast coast from receiving severe damage. After Hurricane Matthew rolled through the Caribbean and killed nearly 900 people in Haiti, the storm continued along the US Southeastern coast, pummeling states like Florida, Georgia, North Carolina, and South Carolina all weekend. At least 19 people have been killed in the US by the hurricane across four Southeast states according to authorities. At least eight people were killed in North Carolina; three people were killed in Georgia; six people were killed in Florida; and at least two people were killed in South Carolina. Local residents may have underestimated the severity of Hurricane Matthew, because it was downgraded to a Category 3 just before hitting landfall in Florida on Friday. It was again downgraded to a Category 1 when it hit South Carolina on Sunday. Regardless of its categorization, Hurricane Matthew still wreaked havoc in the areas it touched. “What those categories don’t include is how water can kill,” said North Carolina Governor Pat McCrory in an interview with the New York Times. In North Carolina—the state to receive the worst parts of the storm in the US—more than 1,000 people had to be rescued on Sunday, and more than 3,000 people were moved to shelters. Nearly 770,000 people across North Carolina were left without power. The storm has left more than 2 million businesses and homes without power along the Southeastern coast. There was special concern surrounding the dangerous storm surge and tide created by the rising waters moving inland from the shore as Hurricane Matthew approached landfall this weekend. Flooding in the region left more than 1 million people without power in Florida by late Friday, and it continued up the coast over the weekend. 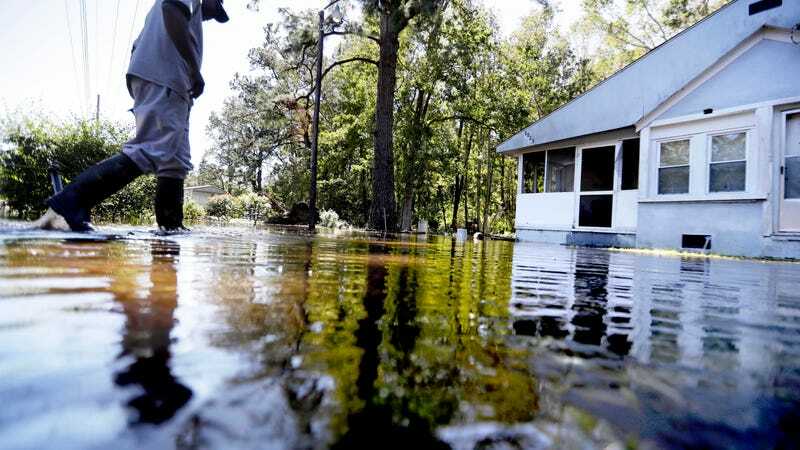 Heavy rains led to record-breaking flooding in North Carolina, where the Neuse River reached 30.9 feet, surpassing the record of 28.9 feet caused by Hurricane Floyd in 1999. The situation was much worse in the Caribbean. The United Nations estimates that 350,000 Haitians need immediate assistance, and UN special representative for Haiti Mourad Wahba says more than 10,000 Haitians are in shelters and hospitals that are overflowing. To make matters worse, only nine of Haiti’s 15 main hospitals were operating. Now, as Hurricane Matthew finally disembarks from its path along the Southeastern seaboard, first responders and others are venturing into areas impacted by the storm, they will be greeted roads completely flooded in some parts of the region. This will likely complicate matters as many areas impacted by the storm are parts of lower-populated areas.